The most centrally located of the major towns of the Outer Banks, Kill Devil Hills has the largest population. The first incorporated town in Dare County, it is the home of the Wright Brothers Monument and the actual location of the Wright Brothers first flight. There is a Kill Devil Hill; it is the dune the Wright Brothers used to launch their gliders as they developed their theories of flight. At the time, Kitty Hawk five miles away, was the nearest town and there were only 300 residents living there. The Kill Devil Hills Lifesaving Station was not far from their camp and Orville cites their aid in his letters. The iconic image of the Wright Flyer leaving the ground was taken by Surfman John Daniels. 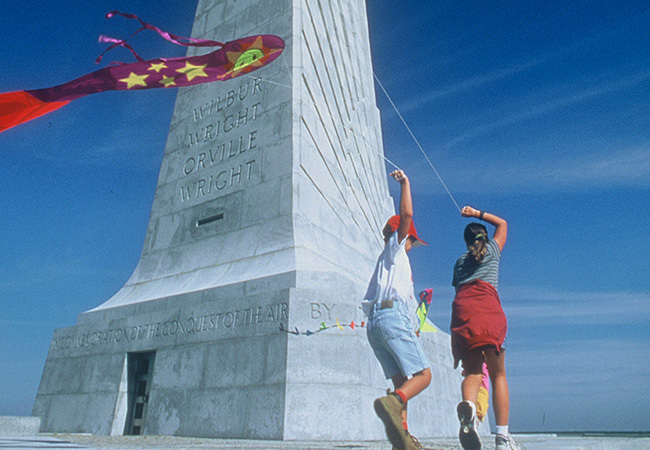 The Wright Brothers Monument was dedicated in 1932, yet in spite of the fame of the Wright Brothers and their flight, Kill Devil Hills remained isolated and undeveloped until bridges connecting the Outer Banks with the outside world were completed in the 1930s. Although the population around the monument remained relatively modest, it was becoming an important tourist destination, and hoping to keep their own unique identity the town incorporated in 1953. The first years after incorporation were difficult, but by 1960 a number of vacation homes and motels lined the beachfront. In 1962 the Avalon Pier was completed. The Dare Center, the first true shopping center on the Outer Banks, opened in 1988. The current population is estimated to be 6920. Kill Devil Hills sits squarely in the middle of the most populous section of the Outer Banks. Kitty Hawk is to the north and Nags Head to the south. The town boundaries are placed at MP5 on the north and MP10 to the south. Almost all businesses are located along the Beach Road (NC 12) or the Bypass (US 158), although unlike any other beach town in Dare County, there are some businesses on streets immediately adjacent to the Bypass. A number of Dare County facilities are found in the town. The county library, water department, Thomas A. Baum Senior Center and Rec Park, a very large recreational facility, are on Mustian Street – named after Emily Long Mustian, the first elected mayor of the town. Seasonal rentals are mostly located between the Bypass and Atlantic Ocean, although there are a few rentals interspersed throughout residential areas. Most but not all seasonal rentals are located between the Bypass and Atlantic Ocean. Colington Island is an unincorporated part of Dare County, but the only way to get there is through Kill Devil Hills. Primarily residential – there’s a pizza restaurant and convenience store on the island – there are a few seasonal rentals in the mix. There is also a small harbor and marina. Colington Road is the only road leading to the island. To find Colington Road turn on to Ocean Bay Boulevard at the intersection with the Bypass. Driving toward the Wright Brothers Airport, the road merges with Colington Road and changes its name. Colington Road is a curvy road and the 35 mph speed limit makes sense. The Colington Cafe and Billy’s Seafood are the best known businesses along the road. Like the other established towns on the Outer Banks, the business district of Kill Devil Hills grew up around the beach and a wide range of services and products are often available within walking distance. On the north end, the beach tends to be narrower more narrow than the southern end. The CAMA Public Beach Access sign with an orange sun denotes public access and the facilities range from parking lots to simple walkways. Most Kill Devil Hills beach access points are a small parking lot with a ramp leading to the ocean. There are two with more facilities. The Hayman Street Access provides ample street parking and a rinse shower. The Kill Devil Hills Bathhouse at the end of Ocean Bay Boulevard provides parking, restrooms and rinse showers. Beach driving is permitted in the off-season. Located in the heart of Kill Devil Hills, the Monument perches on top of Kill Devil Hill – a massive sand dune that was stabilized in 1932 for the construction of the monument. The view from the top is spectacular and it’s worth the effort. The grounds also contain a museum and visitor’s center. The museum is worth a visit, detailing the meticulous attention to detail the brothers demonstrated with artifacts and interactive displays. Part of the experience is the discussion of the Wright Brothers given by Park historians. Bay Drive parallels Kitty Hawk Bay, which is part of the Albemarle Sound. It is a beautiful part of the Outer Banks and worth a look. Although there are no beaches on the soundside of Kill Devil Hills, there are four maintained access points. From north to south they are Arch Street, the Hayman Street Estuarine Access – which includes a very pleasant picnic area. Dock Street between Avalon and West Durham has a boat launch, and West Third Street is the farthest south. Encompassing parts of Kill Devil Hills and Nags Head, the entrance to Nags Head Woods is in Kill Devil Hills off Ocean Acres Drive. A part of the Nature Conservancy, Nags Head Woods is an 1100 acre gem of a maritime forest. Hiking trails traverse a terrain that is surprisingly rugged and hilly. The hills are relict sand dunes that over time have had enough soil deposited on them that hardwood trees have been able to take root. The town of Kill Devil Hills maintains interconnecting multi-use trails designed for biking, jogging, skateboard or an evening stroll. The trails are part of a series of interconnecting trails that run from the Currituck County line to South Nags Head. The Bay Drive trail connects with the airport entrance to the Wright Brothers Monument and is a fairly easy bike ride on flat terrain. That trail continues across the Bypass and connects with a multi-use trail along the Beach Road. The Dare County school system is one of the best in the state of North Carolina and First Flight High School has a well-deserved reputation for academic excellence. In addition to school activities, a number of other organizations take advantage of the school’s facilities. The Outer Banks Daredevils – a summer league baseball team – play their games at the school’s ballpark and the school’s auditorium is the largest and best in the county and is made available to the public if scheduling permits. The school is off Veteran’s Drive. The campus includes First Flight Middle School and First Flight Elementary School. Because of concerns about retreat of the beach, Kill Devil Hills has entered into an interlocal agreement to finance beach nourishment. Dare County is absorbing about 75% of the cost, with the balance being absorbed by Duck, Kitty Hawk and Kill Devil Hills. To pay for their portion of the project – slightly more than $10.5 million over five years – the town has proposed a Municipal Service District (MSD) on the north end of town where the project would take place.